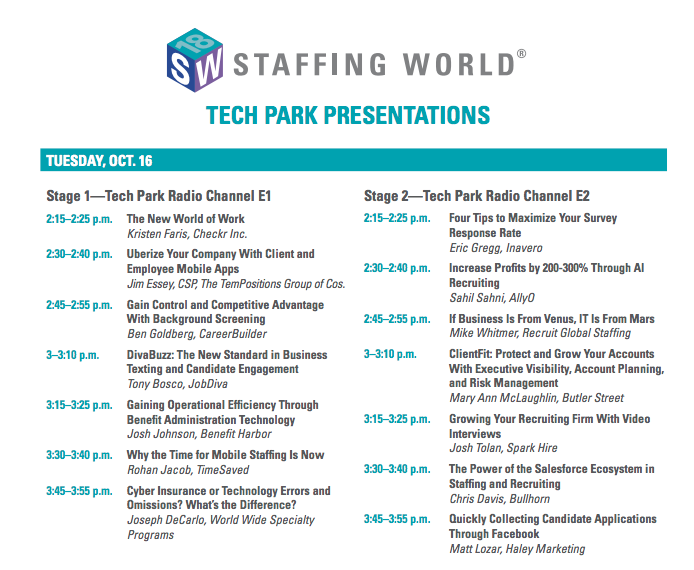 Last year we were honoured to be able to present at StaffingWorld’s inaugural TechPark. This year we’re thrilled to be back at it. We all know tech is transforming the staffing industry at breakneck speeds, and StaffingWorld is rising to meet the occasion. At TechPark you’ll have the chance to see an impressive lineup of technology experts give engaging “Shark Tank”-style presentations of their solutions. You can catch our CEO Rohan Jacob talking about the importance of mobile staffing, and other topics such as AI and the new world of work. Workshops create some of the most important conference takeaways. In this experiential learning opportunity, your creativity and entrepreneurial spirit will be harnessed to work within competitive teams while solving some of the staffing industry’s biggest challenges. Be prepared to chat about best practices and innovative solutions for recruiting and retaining talent, improving the candidate experience using technology, and how to differentiate your business from others. Working together in teams, participants will engage in a shared leadership experience and peer-to-peer problem solving where they’ll benefit not only from their own team’s conversation, but also that of others—as each team will ultimately pitch their solutions to a panel of judges. Because we all want to have a little fun while we’re there.